Stop doing -and calling it- Link Building: It’s Reference Building now! As we are all seeing Google is quickly changing the way of evaluating links, taking social related signals and authority factors more and more into consideration -with special focus in its own social network– and less to those links that could be the result of manipulative tactics, such as link building schemes, by penalizing link networks. In summary, a “reference” happens when an object connects or refers another. In SEO a reference can encompass links, mentions or votes, those signals that a user creates to “refer” a site (or a related brand) and that can increase a site’s authority in the eyes of search engines. In a time when links were the only type of signal that search engines took into consideration to identify trust and authority it made sense to talk about “link building”. Nonetheless this time has ended already and we work now in an ecosystem where users can refer a site or a brand with mentions (in Twitter or Google Plus, for example) or votes (with a +1 in Google or Like in Facebook) not just links, and these are also taken into consideration more and more by search engines. On the other hand, it’s actually far easier to explain to “non-SEO” people how Off-Page SEO works when you talk about “reference building” instead of “link building”, since a “reference” is a well known concept that is more easily related to votes or endorsements than “links”. But why not directly “Relationship Building”? A relationship is “the state of being connected or related” and it is a concept used to call an ongoing, recurrent association. In this sense creating “relationships” should be seen as a scalable strategy to get long-term, consistent “references” (which is actually something really important since scalability and consistency over time has been one of the most challenging aspects of link building… and reference building now). A relationship starts with an initial reference: You need to have an initial *positive* interaction with the site or brand that will make you refer it in the first place… and then *possibly* start a recurrent connection with it. 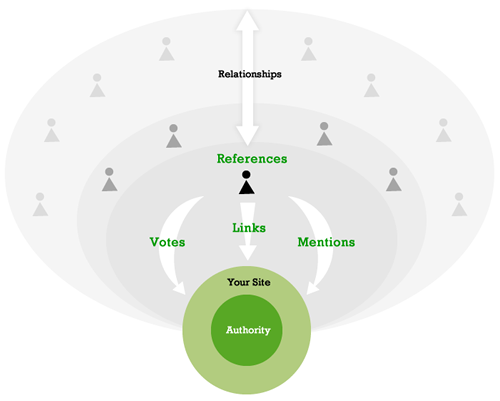 The importance of updating the concept of “link building” to “reference building” is that it transmits the necessity we have to develop interdisciplinary activities -with content marketing, social media, etc.- that were not necessarily taken into consideration before for the typical link building process and for which is sometimes difficult to find support or resources. Are you already creating interesting content (news, Q+A, glossaries, reviews), useful resources (applications, infographics), attractive promotions (contests, giveaways, events), using social networks to distribute them and interacting with your audience, amplifying your online presence, establishing relationships in order to build recurrent references that will lead to more visits and conversions? I hope the answer is yes, otherwise you are already behind and you should start with “reference building” now!